Food availability and access is a necessary condition for food security. 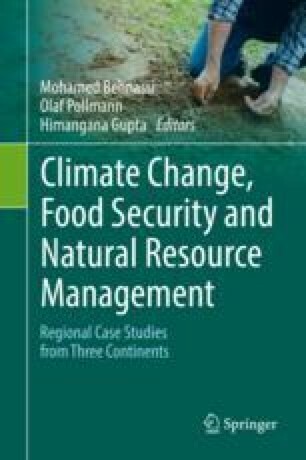 This chapter aims to analyze the state of declining foodgrain availability in India despite record agricultural production and rising food subsidy. In terms of methodology, the data have been procured from the Economic Survey of India and the Annual Reports of the Food Corporation of India. Maximum, minimum, average, standard deviation, and correlation coefficients have been calculated for the pairs of net availability vs. carrying cost, net availability vs. total food subsidy, and food subsidy vs. Public Distribution System (PDS) offtake for analysis. The findings show that the availability of foodgrain ranges from 186.19 to 146.51 kg per person per year and the average 167.14 kg per person per year with a standard deviation of 10.10. Availability declined consistently from its peak of 186.19 kg per person in 1991 to the bottom of 146.51 in 2013. This difference becomes starker when one considers that an average family of five had 198 kg of foodgrain less to eat in 2013 than in 1991. The study found that the correlation coefficient of per capita net availability with subsidy was low at 0.19 but the correlation of subsidy with agricultural production was high at 0.91. The originality and value of this study are derived from its focus on the present government policies and resolutions for food management and the reasons as to why the present policies have not been able to address the problem of food availability in the country. The authors are thankful to the University Grants Commission (UGC), New Delhi for providing funding support for this research in the form of Senior Research Fellowship. New York Times. (2003). Does democracy avert famine? In: N. Y. Times. http://www.nytimes.com/2003/03/01/arts/does-democracy-avert-famine.html?pagewanted=all&src=pm. Accessed 16 May 2013. United Nations. (2014). United Nations millennium development goals. http://www.un.org/millenniumgoals/poverty.shtml. Accessed 17 Aug 2014. USAID. (1992). Food security. http://www.usaid.gov/guatemala/food-security. Accessed 14 May 2013. World Food Summit. (1996). WHO|Food Security. In: WHO. http://www.who.int/trade/glossary/story028/en/. Accessed 14 May 2013.